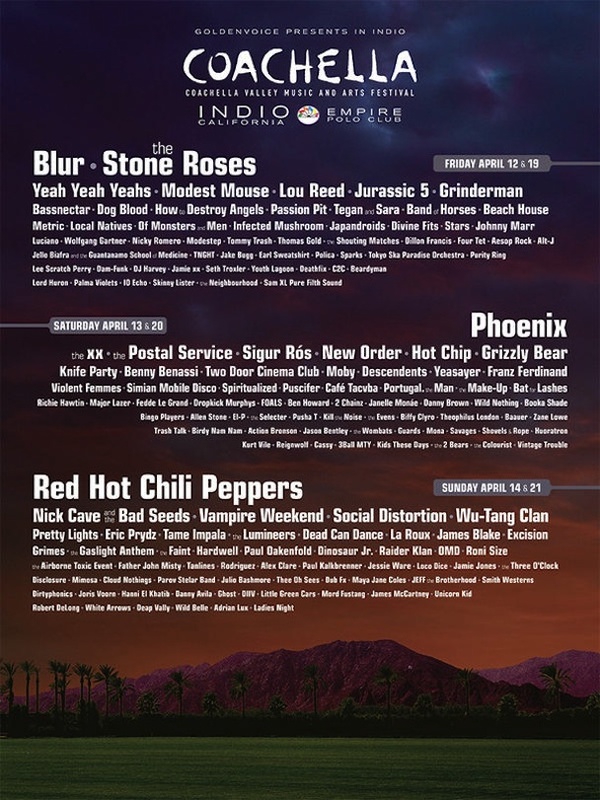 So the day I’d been anticipating for ages finally came… The Coachella 2013 line up announcement. To be honest, I was dreading it (or my bank account was) because I knew if it was as good as last year I’d be booking a ticket and not eating for the next three months in order to go. Luckily, for my bank balance’s sake, I wasn’t blown away. As good as they are, I didn’t feel as though the headliners, are worth a trip to California since their probably isn’t going to be any year defining ‘stunts’ this year. Let’s face it; if getting to see Dr Dre and Snoop (then) Dogg on the West Coast wasn’t enough, we were just so lucky enough to be graced with an appearance from the one and only Tu Pac, in hologram form. No disrespect to Blur and The Stone Roses, but with their oh-so-cool reputation I don’t think it’s in their nature. The Red Hot Chilli Peppers on the other hand are more likely to pull something out the bag, especially being Cali natives, but they don’t have that flash attitude that the rappers have. Last year, I thought there were a fair few British acts on the line-up but this year I think there are taking over. The funny thing is that there are so many of my favourite artists on the list, but I have seen most of them in the last year or am going to see them in the next few months. As amazing as it would be to see them live, tucked neatly between the beautiful mountains of Palm Springs, on the super green, mud-free manicured lawns of Empire Polo Club, you just can’t beat seeing an act that you love on their own stage. Coachella 2012 was an amazing experience for me, so I’m going to leave it at that and maybe make my return to Indio in 2014 instead.